The CARON Collection would like to thank McCalls Needlework for making these charts available for online conversion and for our visitors' access. 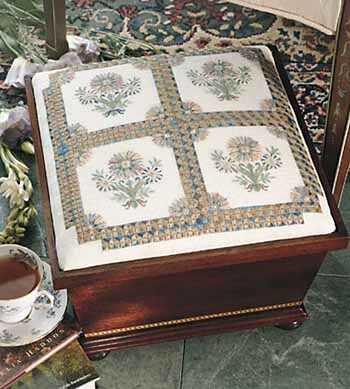 "Brilliantly displayed in a footstool, the Variegated Daisies embroidery adds shimmering elegance to a formal room with its silk, metallic, and transparent threads. 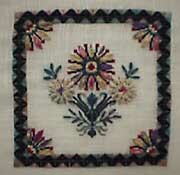 For an additional project, stitch one section of the design as a smaller framed piece or as a coordinating pillow." Below another version of the Variegated Daisies design adapted to make a framed piece and stitched with different color combinations. COPYRIGHT NOTICE: These charts and instructions are provided for our web site visitors who are granted permission to print them out for personal use but cannot be reproduced (electronically or otherwise) or copied without the express written permission of McCalls Needlework.